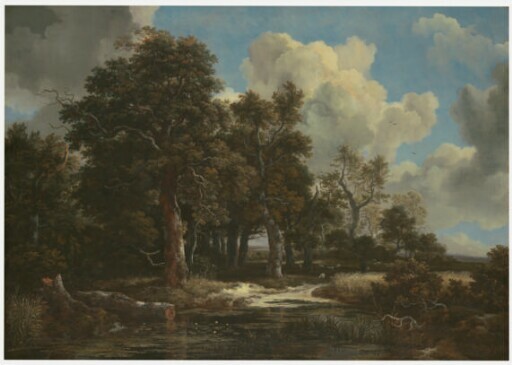 Jacob van Ruisdael, one of the greatest landscape painters of all time, flourished in the latter half of the seventeenth century, Holland’s “Golden Age.” Born in Haarlem in 1628 or 1629, the son of a painter and picture dealer, Ruisdael was probably tutored by his uncle Salomon van Ruysdael, another landscape painter. Ruisdael began painting in his teenage years and moved to Amsterdam in 1655, shortly before he began Edge of a Forest with a Grainfield. Paintings from this period in his life are the ones for which he is most renowned. They typically emphasize the majestic power of natural forms—noble trees and cloud-filled skies—and an increased mastery of light effects to give those forms emotional resonance. A prolific artist, he completed some 700 paintings over the three decades of his career, before his death in 1682. Edge of a Forest is ranked as one of his highest achievements, from the years of his greatest genius. A grove of old oak and elm trees stands beside a pool or a stream, at the intersection of a sandy road or path. Tall timbers reach towards a cloudy sky. Every detail of the painting attests to the artist’s keen eye and his love of natural variety and incident. Everywhere he leads the viewer towards something to he thinks should be noticed: a broken branch lies bent in the lower right, pointing the way into the canvas; a puddle of water in the sandy road reflects the bark of the tree above it; delicate flowers of a water lily poke their heads above the water; a bush is in flower in the shadowy glade beside one of the trees, while silvery-green leaves shine between patches of ivy green. These myriad details, however, do not distract from the impressive unity of the whole—the sense of nature, in its grandeur, captured by a painter who truly loves it. purchased (through Christie’s, London) by Kimbell Art Foundation, Fort Worth, 2014.